Simon is a fat cat. He was given to me by a friend who found him as a kitten sitting atop a trashcan on the coldest Christmas Eve in recorded history. My friend assured me that I’d be caring for him for “just a few days,” until such time as a dedicated home could be found. Six years later, he’s still living with me. Having grown up a stray, he never knew when his next meal would be. As such, he devours all the food in the food bowl. I try my best to ration his meals, but he’s still a heavy eater. And a fat cat. Several years ago I took Simon to get a haircut. 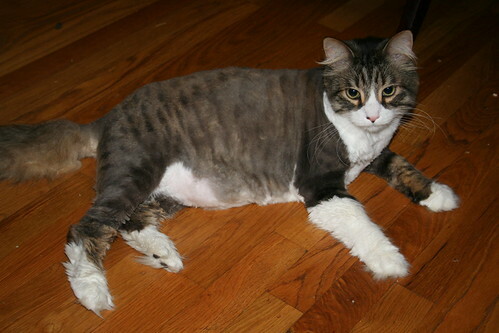 He was so fat that grooming was hard for him to do. I didn’t brush him enough, and large sections of his hair began to mat together. It pulled his skin, and made him uncomfortable. So I took him to a local groomer for a haircut. 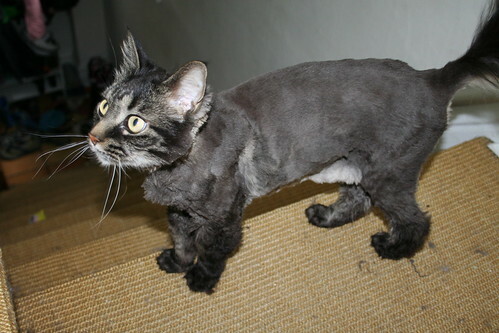 When I got him back, he was shaved like a French poodle. Everyone, save one, who saw Simon during the next several months laughed pretty heartily. It was a comical sight, but I think we all gave poor Simon a bit of a complex. The first time Tyler saw him, her eyes sparkled as she exclaimed “Oooh! He looks so fancy!” She was genuinely impressed by his new style. To this day, Simon has always been a little sweeter toward Tyler than anyone else. Simon’s hair grew back. He’s still fat, so he’s still not grooming himself very well. As the summer heat advances, I thought it might be nice for Xanth and Echo to get trimmed, too, since they’re also long-haired cats. I scheduled an appointment at the same local groomer as the last time. When I dropped them off this morning, the lady at the counter asked me “Do you want us to keep the mane, or would you like that trimmed, too?” Not knowing what to expect either way, I said I didn’t really care. I joked several times through the day with different people that I fully expected to pick up cats with French poodle hair cuts this afternoon. In truth, I assumed that the reason Simon was shaved so was because his hair was so matted and gross that it was the only way they could deal with him. 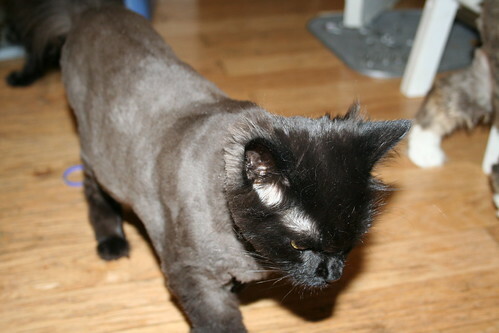 I picked up the cats this afternoon, and all three of them had been shaved. The manes were trimmed down, so they don’t look quite as much like poodles as the first time Simon got a haircut, but they still look pretty goofy. Simon and Echo are hefty cats, so they don’t really look that bad. 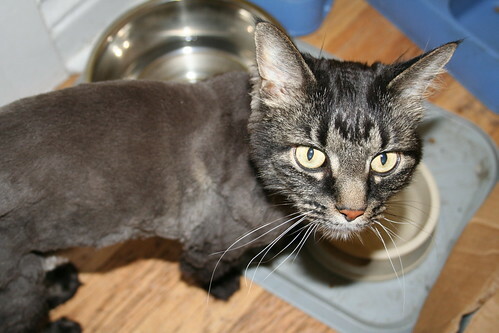 Xanth is a skinny cat, though, and without his long hair he looks downright sickly. Surprisingly, he’s the easiest to photograph. Echo and Simon won’t hardly sit still long enough to capture.